- Compact instrument with full arrangements for conducting Newton's Ring experiment. - A standard microscope unit with 30x magnification and rotatable cross line eye piece. Owing to the vast experience in this field, we offer finest quality Newtons Ring Microscope to our valuable customer. 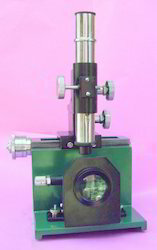 This microscope is widely used determination of wavelength of light by measuring Newton’s rings diameter. A compact instrument containing all the optical accessories for conducting the Newton’s Ring experiment, our microscope is specifically designed for laboratory use. With top grade optics and precise machining, our Newton’s Ring Microscope is ideal for determining wavelength of sodium light by measuring Newton’s ring diameter. The base is cast iron with the top machined. The microscope is mounted on a travelling carriage sliding on the top of the instrument and can be clamped at any position . The Brass scale is graduated in mms and travels 15 mm vernier reading to 0.02 mm, with rack and Pinion arrangement .Final readings are taken with a Micrometer screw provided for the purpose. •A standard Microscope unit with 30x magnification and rotatable cross line eye piece. •Focusing of microscope is through Rack and Pinion. - Focusing of a microscope is through rack and pinion. 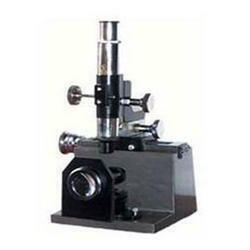 We are well-established as one of the trusted Newton's Ring Microscope manufacturers & Exporters in India. The Newton's Ring Microscope offered by us is extensively demanded in the market as no alternative is available in terms of quality and performance.